Like pretty much every other major Japan-based corporation, Sega — or SEGA Sammy Holdings to be more accurate — has published its financial results. For Nintendo gamers it reveals some interesting, and pleasing, results. 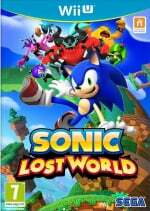 To start off with some reasonably positive news, Sonic Lost World has reached 710,000 sales on the Wii U and 3DS as of 31st March, which has climbed a little from the 640,000 sales up to 31st December 2013. It's not clearly broken down, but we suspect over 50% of those sales were for the 3DS version. Sega is listing multiple SKUs for Wii U, which probably includes Mario & Sonic at the Sochi 2014 Olympic Winter Games; if that's the case then the sporty title appears to have sold rather poorly, but a firm figure isn't given. On the flipside the number of products listed for 3DS suggests that the 3D retro re-release range is included, and if so account for a six figure number in sales. Particularly intriguing is the information on SKUs — products — estimated and planned for this financial year, from 1st April to 31st March 2015. The Wii U has the second most products (4) out of home consoles, though way behind PS3 with 11 — 600,000 Wii U game sales are estimated. It's the 3DS that captures attention, however, with a whopping 13 SKUs on the way with estimated sales of 2.27 million unit sales. That would easily make the 3DS the highest-selling individual dedicated games platform for Sega — with numbers like those we'd hope we're dealing with worldwide releases, while the number of SKUs hopefully points to more of those 3D retro delights. As for what we know is coming, we do have Sonic Boom coming to both Wii U and 3DS, and the portable Sonic games in particular do continue to deliver strong results. With the number of SKUs projected, however, we can safely assume that Sega still has treats to reveal as the year progresses. It's good to see the Wii U still having reasonable support from Sega, but the 3DS appears to be the platform of choice. Exciting times ahead for Sega fans. Sega does what Nintendoes also. Thank you Sega for your unprecedented partnership. I hope the western release of 3D Outrun is among those new games. yes interesting how bandai namco and capcom have made a lot of profit from the 3DS and yet they show little support for Wii U, at least Sega is supporting both platforms, well for now. That's pretty encouraging considering that both Sonic: Lost World and Mario and Sonic at the Olympic Games reviewed pretty poorly. Hopefully Sega will do something right with Sonic Boom...but it's interesting to know they have 3 other titles in in the works for the U.
Hmm... These sales look good, with all the crap Nintendo's endured, I'm glad to see Sega continue their support. I'm interested in the sonic boom thing, I wonder what the 3ds version will be like and how much it'll sale. Now they need to make another skies of arcadia. Sega need to make another Sonic Colours style Sonic, as I wasn't as impressed with Lost Worlds. I've always been satisfied with the Olympics games, (I know, how could I?). I think Sega count each regional release as a new SKU. So one game released in Japan, North America and Europe would be counted as 3 SKUs to them. Hope I'm wrong though and we're gonna get a ton of 3D Classics. From their financial report, it's clear the PC market is gonna be their focus, but the gamepad is ideal for a lot of those PC centric titles. I wonder if they'd consider porting the Football Manager Handheld title to Wii U. It would be great to play on the gamepad. I will always have a soft spot for Sega and especially Sonic. They aren't what they used to be, but i'll still keep supporting them, especially as long as they keep putting games on Nintendo consoles. Remember Atlus is now owned by Sega and they have a few games that would account for some of those sku's. @benjamines This made me lol so very, very hard. But then, I'm 26, so... I am of that age. Bring a Yakuza HD collection to the west! Sega's biggest platform is still Steam. (Football Manager / Total War). The strategy of keeping the Sonic and Megadrive stuff always on sale must be working as well. Sega are doing well. (I suspect even on mobile because the quality is so high and they support real controls. Those Sonic ports are far better than the 3D Classic I think). I'd welcome Conduit 3 but it's not very likely. Happy about them supporting the U no matter what those games are. Of course Sochi 2014 sold poorly. How many adverts did you see for that game? I didn't see a single one. The fact the game was a lazy rehash was just frosting. But why no Wii u Sega vc releases??? Good to see that they are supporting it better. Just wish I liked Sega games more. The few franchises they make that I am interested in have been used little lately. Shenmue, Valkyria Chronicles, Phantasy Star, Shining Force, and Virtua Fighter need to resurface on the Wii U. Frankly, I would appreciate if Sega released some of their HD PSN/XBLA games on eShop. I'd love to play Guardian Heroes on Wii U. Also, I think they should do a House of the Dead collection with 1-4 + Overkill Extended Cut. I'd buy that so fast it hurts. That number for Lost World is kinda low since its across 2 platforms, right? Hopefully Sonic Boom does better. Great that sega is supporting Nintendo a lot. If only other third partys would do the same. @Peach64 Man, Football Manager on my Wii U would definitely be quite the time sink. I wouldn't even miss the likes of FIFA and PES. An offline, single-player Phantasy Star RPG on the U would make me extremely happy as well. I know this is likely impossible but maybe a 3DS F-Zero? SEGA was involved with GX which usually gets considered the best F-Zero game. now wondering, those these numbers now include Atlus sales or Atlus it is still considered a separate company despite being owned by Sega? @Nintenjoe64 : I would love Yakuza on my Wii U. Actually, I would love some dreamcast games too. Sega and Nintendo should be filling up the virtual console. Good not a bad game but it could've been better that story ended with too many plot holes. Now please make Adventure 3 with Generations game play. The game was meh. They need Sonic Adventure 3, not freaking Sonic Boom. If anyone from SEGA is listening please make Crazy Taxi 3DS, plus talk to Nintendo to make F-Zero 3DS or F-Zero U! How cool Sonic Lost world has gone GOLD for sure ! @SecondServing That's exactly what I thought when I first saw Sonic Boom. Adventure 3 would've been a killer exclusive to the Wii U! 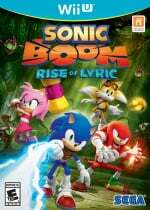 @FilmerNgameR except with a TV show, Sonic Boom will draw in kids who watch the TV show, while a new Sonic Adventure will only draw fans of the Sonic Adventure series, and I feel a new Generations game would draw more, but I feel that Sega are keeping that one as multiplatform. @MadAdam81 Yeah it makes more sense for Adventure 3 to be muiti platform but Sonic doesn't need a tv show to draw in attention I've seen so many little kids talk alot about Sonic in a nearby elementary school and every time I wear a Sonic shirt little kids always blurt out Sonic when they see my shirt where ever I go, point is that Sonic has a growing fan base among children already and they will get whatever Sonic game they see so a tv show isn't needed. Wii U Vc support?? Please? I could name a ton of classics sega is sitting on that belong in the eshop and I feel sega is missing out of a lot of $$$$!! Also: "Keep that crappy new Alien game on the other systems because even if it's good it doesn't deserve to be on Wii U." Props to @Fireninjastar for actually mentioning the newer games. I love you man. You were there all the way through my childhood. And now that you are best buds with my other childhood staple,Nintendo, things are looking bright...So im sure you appreciate how much it pains me to say: WHAT THE HELL HAPPENED TO YOU! You were the go to company for incredible games like outrun, streets of rage, shenmue, skys of arcadia, sonic adventure 1 and 2. Now we only have lightweight Sonic? Oh no im sorry you are making another crazy taxi game...FOR MOBILE!? Please make amazing games again,ones that dont have to involve a blue hedgehog. Significant 3DS support is brilliant, but we appear to be glossing over the fact that there's not much in development for the Wii U, especially from a developer that seems committed to Nintendo. Are we just gracefully accepting the Wii U's a failure now? There's SO MUCH that SEGA could bring to the Wii U and they could also convince Atlus to bring a number of games over, which would drastically increase the console's appeal, but instead it just appears they're just releasing games on it reluctantly. This year is going to be make or break with Nintendo as the PS4 and X1 will start powering forward with some great titles, while Nintendo have Mario Kart 8, Bayonetta 2 and to a very lesser extent Hyrule Warriors as their big hitters. All of which are unfortunately going to struggle to see the Wii U through (they're going to be awesome, but aren't going to sell consoles by the boatload). Even Nintendo are giving up on it, and I really thought that SEGA would be one of the companies dedicated to supporting the Wii U. So much potential, but so little support. I want those years back where Nintendo could have a console that wasn't a top seller but had some absolutely incredible titles. The N64 never matched the PS1 in sales, but gave birth to games that were so incredible, they still inspire to this day. Where is that Nintendo now? To be fair, Mario & Sonic at the Winter Olympic Games on Wii U isn't that good (I bought it cheap)....it's basically more or less the same game as the Wii version with bells and whistles, and actually worse in some ways. We see all these doom and gloom stories about low game sales on Wii U, but fact is, some of them don't deserve to sell in great numbers. Sonic Lost World on Wii U on the other hand....I don't understand all the hate for that, excellent game. Seems like it was too difficult for a lot of reviewers, maybe Sega should've put an Easy mode in for them and a proper training level that explicitly explained the difference between how the A and B buttons function with regards to jumping/attacking, and it would've had 8s and 9s across the board. That Nintendo is still here, making exactly the same kinds of games it was back then (awesome 3D Marios and Zeldas, party games, etc) but Rare was responsible for much of the N64's success. One of the worst things Nintendo ever did was to sell off Rare to Microsoft and not immediately replace them with another top shelf developer as Rare were making exactly the kinds of games that appealed to Western gamers, and pretty high quality ones too. Now Rare are a mere shadow of their former selves (strangled by Microsoft) and Nintendo is badly struggling to remain relevant in the West. Sure, Nintendo have Retro Studios now, but they're only known for DKC Returns and Metroid Prime, and nothing else (even though those games are great)....Rare had Blast Corps, Banjo Kazooie, Jet Force Gemini, Perfect Dark, Conker and Killer Instinct, as well as being in charge of Donkey Kong whilst they were with Nintendo. @Yorumi You're right! It was one of the best game i ever played we need another one !!! That's great news, I love Lost World on WiiU so I'm glad it sold well across both platforms. Here's hoping they team up with Nintendo at E3 and announce new installments of dormant titles. I just really hope to see some more atlus games get localised in Europe. SAY IT! SAY IT! SAY IT! SEGA!!! I wish Sonic Lost World did better. To me it is the best platformer game on Wii U so far. Sega Master Race! Just you wait they will announce Dreamcast 2 at E3 this year. I've got to wonder whether these will be almost entirely Virtual console titles, it is likely to be largely an Atlus move. It would be nice to get a Rhythm Thief sequel too.